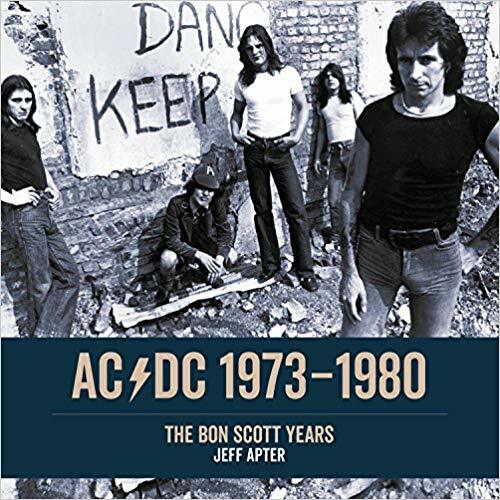 “AC/DC 1973-1980: The Bon Scott Years”, a richly illustrated guide to the glory years of Australia’s finest musical export, will be published on November 14 by Jawbone Press. To fans and critics alike, the years 1973 to 1980 — the Bon Scott era — are the most significant of AC/DC’s five-decade career. In a prolific and frequently brilliant run, they recorded six studio albums, established a diehard fan base that stretched from Australia to Europe to North America, toured relentlessly, and created no small amount of controversy and chaos. At one low point in Australia, the band’s records were banned, their shows were cancelled, and they were hounded by the police — all because Angus Young dared bare his spotty backside at a press conference. In the midst of the mayhem, however, they were building a body of work that remains unmatched in hard rock. Many of AC/DC’s classic songs were cut during this time — “Dirty Deeds”, “Rock ‘N’ Roll Damnation”, “High Voltage”, “If You Want Blood”, “Whole Lotta Rosie”, “It’s A Long Way To The Top”, “Let There Be Rock” and more — and it says plenty that these fan favorites are still staples of the band’s live sets today. Packed full of rare photographs and memorabilia, this large-format, full-color book documents all the key events of this frenetic time, beginning with the band’s very first shows in the bloodhouses of suburban Sydney — even before the name AC/DC had been dreamed up by Margaret Young, Malcolm and Angus’s big sister — and culminating with 1979’s “Highway To Hell”, the album that paved the way for the mammoth success of “Back In Black” and all that was to follow, and the untimely death of Bon Scott, which prompted both an end and a new beginning for the band. Jeff Apter is the author of “High Voltage: The Life Of Angus Young, AC/DC’s Last Man Standing”. He ghostwrote “Dirty Deeds”, former AC/DC bassist Mark Evans’s memoir, and also worked as ghostwriter with AC/DC’s former manager, Michael Browning, on his book “Dog Eat Dog”.